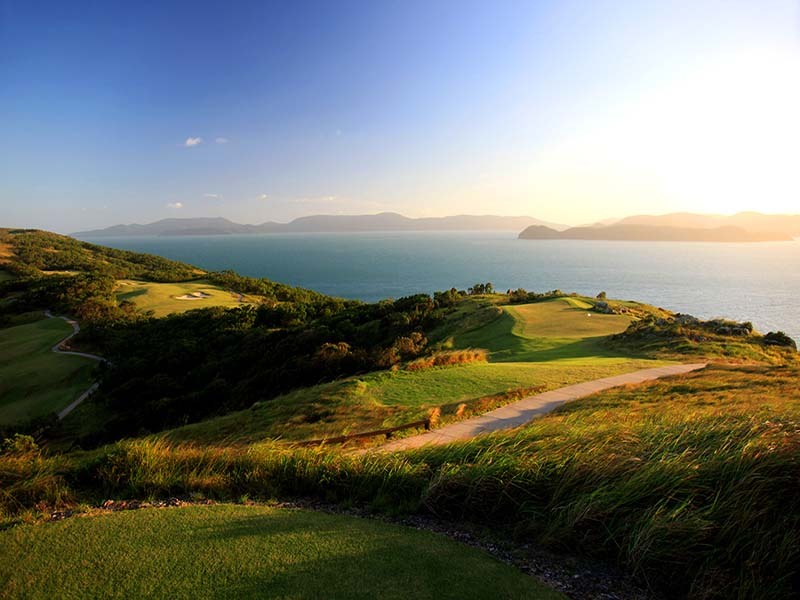 Enjoy incredible views of the azure Coral Sea and the tropical Whitsunday Islands from your Coral Sea View Room! Relax on your king or queen bed, tune into in-house movies on your TV and snack on the delicious treats available in your mini bar. Take the whole family! Children (0-12 years) can stay free of charge when sharing the same room as their parents and using existing bedding and eat for free when selecting from the special children’s menu at participating restaurants! Enjoy this exclusive bonus extra on us! Put your resort credit towards a delicious and innovative meal at the Pool Terrace restaurant or tropical and refreshing drinks throughout the day while you relax by the pool! 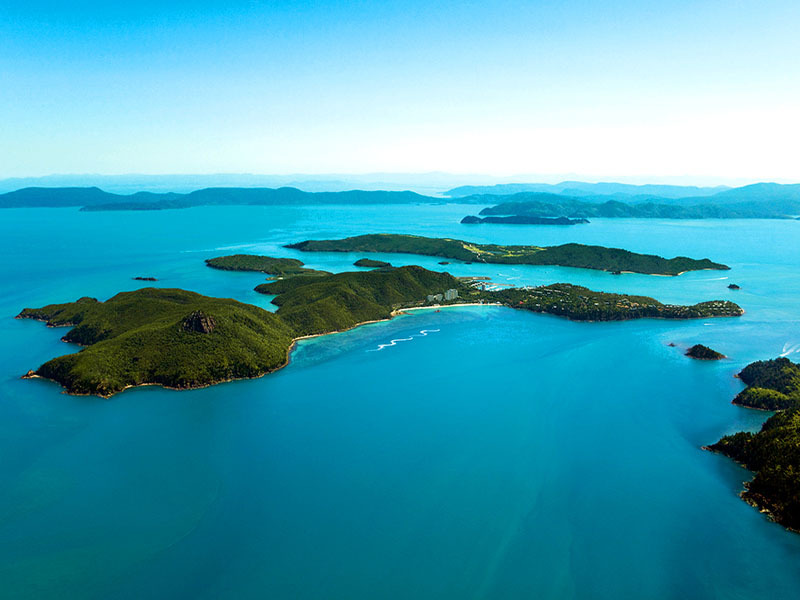 Cruise on board the ‘Orca’ to the magnificent Whitehaven Beach and the spectacular Whitsunday Islands National Park! Explore some of the more remote beautiful bays, islands and beaches and see the very best of the Whitsundays National Park on this fully guided half day cruise. You will never be bored while staying at the Reef View Hotel Hamilton Island with complimentary use of catamarans, paddle skis, windsurfers and snorkeling equipment! Also enjoy complimentary use of resort facilities including the spa, sauna, tennis court & resort gym! Get out and explore the area with complimentary use of the island daily shuttle service. Be surrounded by the manicured tropical gardens when you stay in a Garden View Room. Relax on the private balcony to get the best views of the gardens. Boasting a huge 65sq. metres of space, these rooms are well equipped with a range of amenities such as air conditioning, tea/coffee making facilities, TV, Wi-Fi access and minibar. The rooms can accommodate up to 4 guests with the two queen beds and the spacious ensuite bathrooms are complete with a separate shower and bathtub. Set higher in the building, Coral Sea View Rooms are spacious and comfortable, coming in at 64sq. metres. The room opens up to a private balcony that overlooks the azure Coral Sea and surrounding Whitsunday Islands. Inside, the space boasts contemporary furnishings and everything your tropical getaway could need—from air-conditioning to Wi-Fi; in-house movies to iPod connectivity, tea and coffee making facilities, a mini-bar and more! 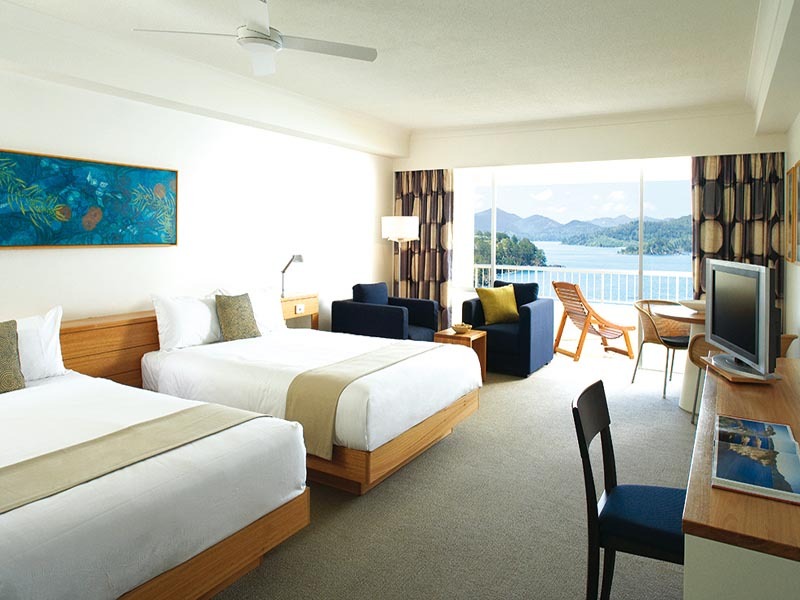 Coral Sea View Rooms can accommodate up to 3 guests comfortably on twin Queen beds. 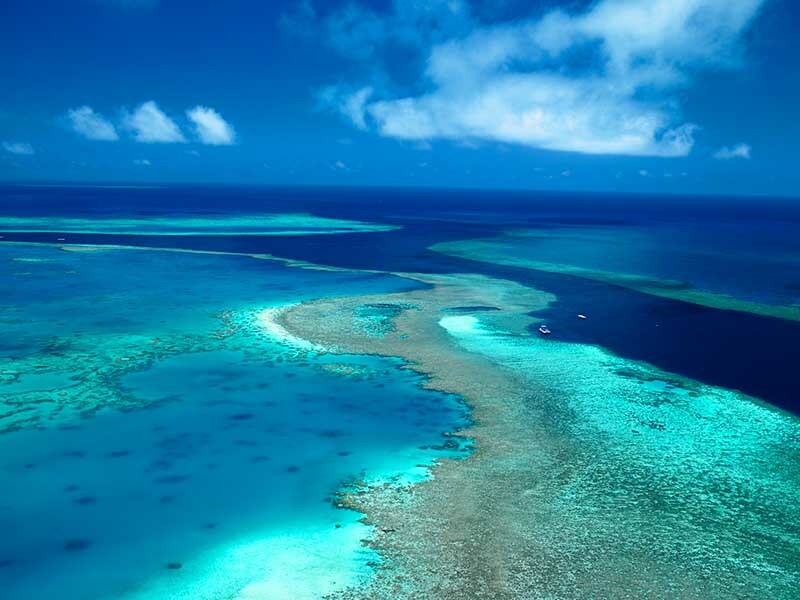 King Coral Sea View Room – UPGRADE for the best ocean views from only $200 per person! Set on floors 13-18, King Coral Sea View Rooms offer space, luxury and spectacular Coral Sea views. 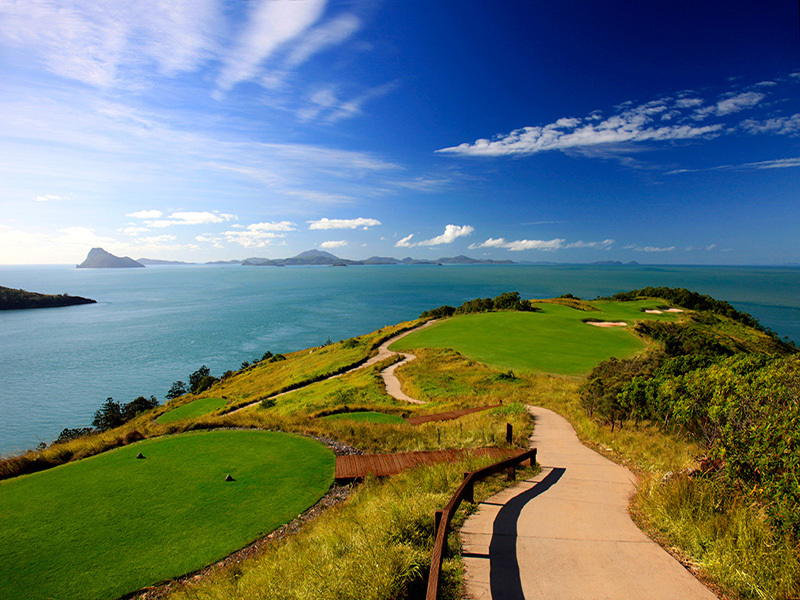 Greet each day on your private balcony, surveying the Whitsundays as you plan your next move. Inside, enjoy up to 64sq.metres of chic, contemporary space. Features include plush King bedding, air-conditioning, Wi-Fi, iPod connectivity, in-house movies, tea and coffee making facilities, a mini bar and more! King Coral Sea View Rooms can accommodate up to 2 guests. Located opposite Catseye Beach, the Reef View Hotel boasts a variety of room types that are suitable for romance, couples, families or groups of friends travelling together. Each room has a balcony overlooking the manicured tropical garden or the stunning Coral Sea, and the resort itself features a restaurant, bar, and gorgeous outdoor swimming pool as well access to a range of activities and facilities across the island. 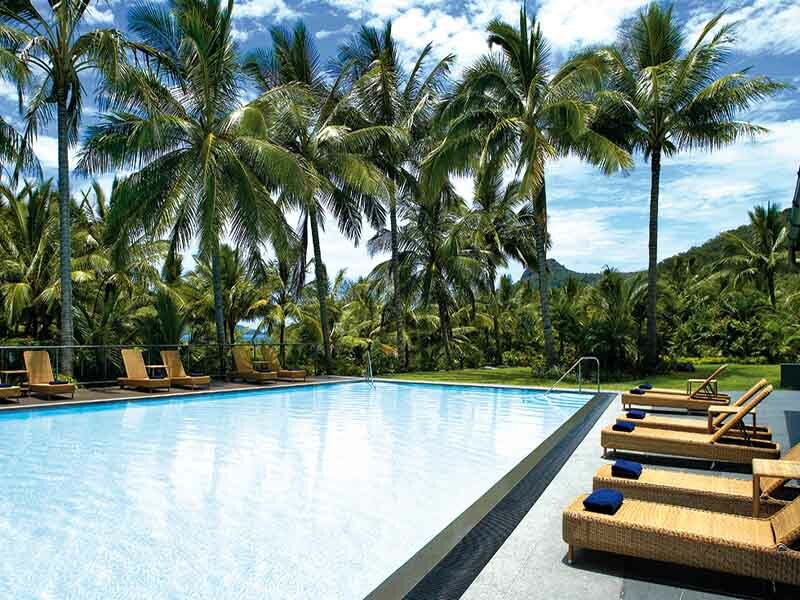 Read more about Reef View Hotel Hamilton Island here! #Kids Stay & Eat FREE: (a) Accommodation: Children 12 years and under at time of travel stay free of charge when sharing with parents and using existing bedding. Cots are free of charge and should be requested at time of booking. Where children 12 years and under do not use existing bedding, a rollaway is available at a cost of $45.00 retail per night which is payable direct to the hotel. Please note that Beach Club does not cater for guests under the age of 18 years. (b) Meals: Children 12 years and under eat free when selecting from the special children’s menu and dining with parents in selected restaurants. 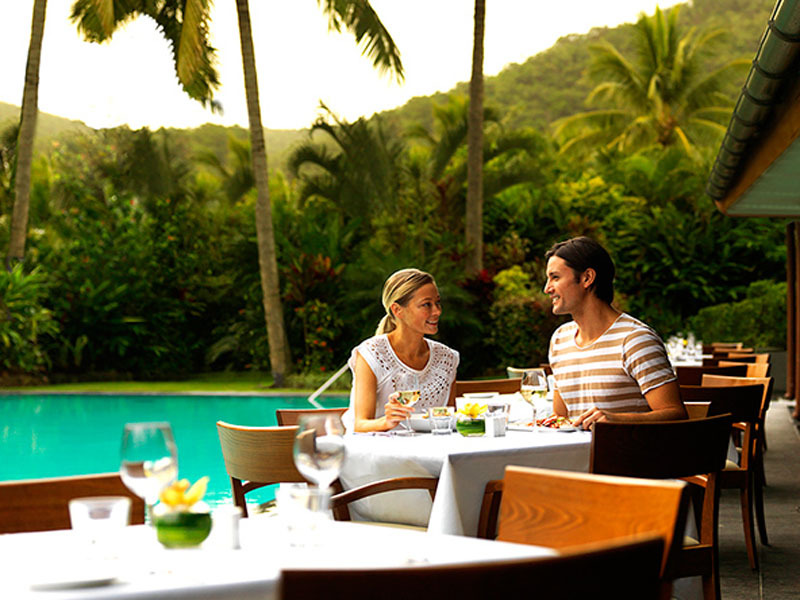 Participating restaurants include Pool Terrace Restaurant (breakfast, lunch & dinner), Manta Ray (breakfast, lunch & dinner), Sails Steak & Seafood Grill (breakfast, lunch & dinner) and Wild Life Hamilton Island (breakfast only), coca chu (dinner only). Please note restaurants are subject to change. 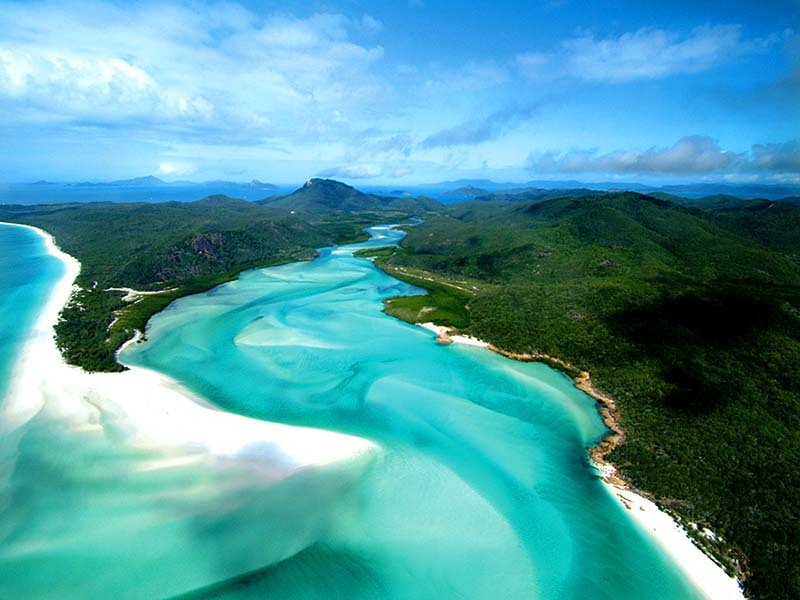 ~Whitehaven Beach Half Day Cruise: Includes: Complimentary tea and coffee, Cruise the 74 islands of the Whitsundays, Fully guided cruise with informative commentary, 1 1/2 hours at Whitehaven Beach & Magnificent waters of Cid Harbour. Choose AM or PM tour – please advise your friendly travel consultant which you would prefer upon booking. Children: 4-14 years, 3 years and under free of charge. Please check with your accommodation or Cruise Whitsundays website for updated schedule departure times. 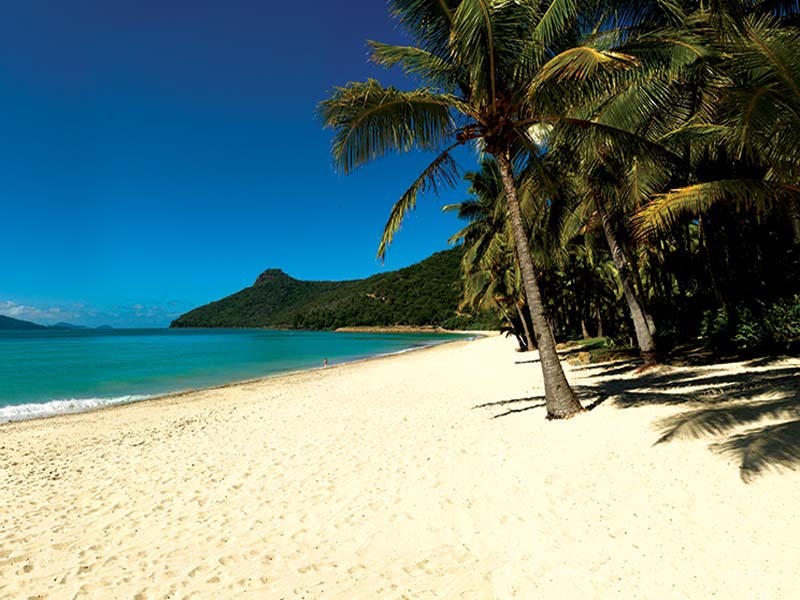 To reconfirm or change your booking please call Cruise Whitsundays 48 hours prior to departure on (07) 4846 7000 .